Slobodan Praljak (2 January 1945 – 29 November 2017) was a Bosnian Croat engineer, movie and theatre director and army general. He was a general in the Croatian Army and the Croatian Defence Council, an army of the Croatian Republic of Herzeg-Bosnia. In 2013, he was one of six Bosnian Croat politicians sentenced at the International Criminal Tribunal for the former Yugoslavia (ICTY) for war crimes during the Croat–Bosniak War. He was jailed for twenty years. He directed many television shows and one movie, Povratak Katarine Kozul (1989). 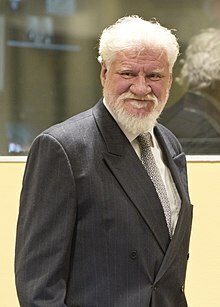 Praljak was born in Čapljina. He was married to Kaćuša Babić and had two stepchildren. On 29 November 2017, Praljak drank cyanide at the ICTY in The Hague, Netherlands. He later died at a hospital of heart failure at the age of 72. ↑ "Praljak trial: Bosnian Croat war criminal 'takes poison' in court". BBC. 29 November 2017. Retrieved 29 November 2017. ↑ "Bosnian Croat war criminal dies after drinking poison in UN courtroom". The Daily Telegraph. 29 November 2017. Retrieved 29 November 2017. This page was last changed on 20 June 2018, at 04:37.